The DAT format is especially interesting to me because it is highly advanced for the time of its debut in the late 1980's. The DAT format specifies uncompressed 48kHz, 2-channel, 16-bit PCM audio data. The fact that it is uncompressed blew my mind. This is a format that exceeds Red Book CD audio specifications coupled with the charm of an unusual format. I picked up a Sony DTC-690 from Craigslist that was in great working order. There is just something really sweet about mid-90s Sony gear and their perfectly labelled switches. It fits in well on the shelf with my more modern Marantz components. 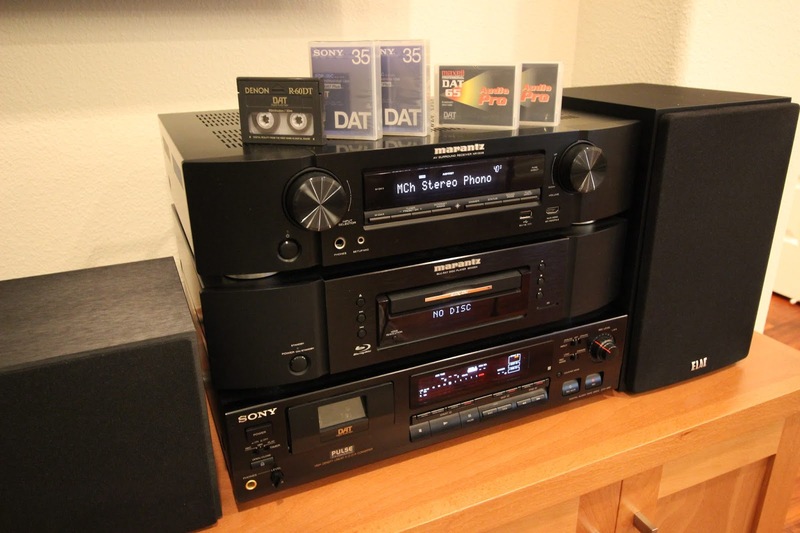 The DAT format never caught on in the consumer market for a variety of reasons but did gain some success in the professional recording industry. The tapes were popular to use as masters. This makes sense given the fact that the data is uncompressed and stored at a high sample rate. The tapes come in a variety of lengths. I have 35, 65 and 60 minute tapes. 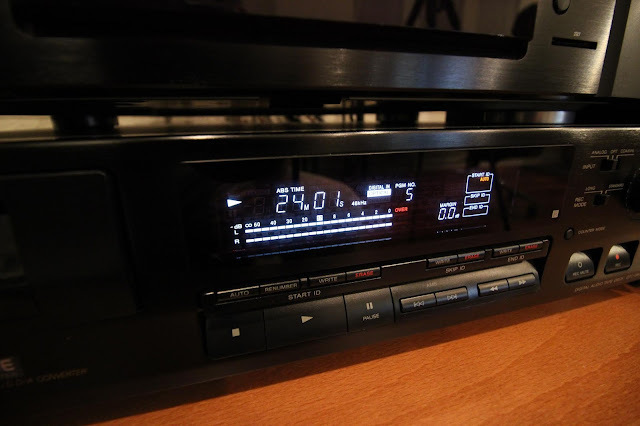 The DAT tape decks include a digital input and output. These take the sample data provided to them and commit it directly to tape. 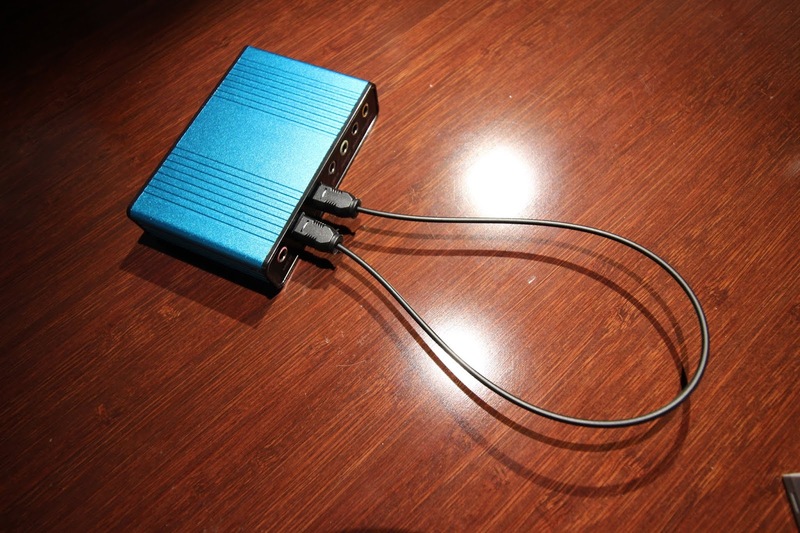 This is great for audio because you can make a perfect copy of any input source. I had the idea that any arbitrary data could be fed into the digital input. It doesn't necessarily need to be real audio sample data. $$ Bandwidth = SampleRate * BytesPerSample * ChannelCount\\ Bandwidth = 48000 * 2 * 2\\ Bandwidth = 187.5kB/s $$This is decently high bandwidth and likely high enough to support modern video codecs. Once I had demonstrated that there was enough bandwidth available on the tape I started to write the datvideo tool. In order to store arbitrary binary data on the tape, I would need a way to synchronize the receiver with the data on the tape. There could be some audio data, followed by a binary blob, followed by more audio data. The receiver does not know when it will receive a specific type of data, so a system must be devised to signal to the receiver that some binary data has begun. It would also be nice to have some error handling in the form of a CRC. Though it is unlikely that the hardware will introduce errors in the data, it is possible that something in the audio path could introduce some unexpected behavior (some gain on the signal, or the like). I opted to use the frame format specified by RFC-1662 which is commonly used in PPP (point-to-point) networking. The nice thing about this format is that it is easy to implement, has some error handling and can easily mix in with other forms of data thanks to the escaping feature. More details can be found in the specification. I used a cheap USB sound card to send/receive data to/from the DAT deck. The sound card that I selected has S/PDIF inputs and outputs. 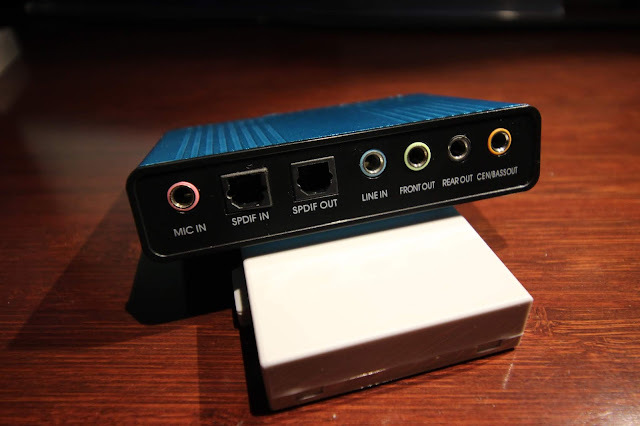 I will use a TOSLINK cable to connect this sound card to the DAT deck. When the binary data stored on the tape is played back, it sounds like noise and pins the level meter. It is interesting when music is interrupted with binary data and the music resumes. In order to test all of this, I created a loopback on the sound card so that I could avoid using the tape deck during development. I wrote a tool called datvideo that helps with this project. It has two modes: encode and decode. The encode mode takes an input file and generates a raw "audio" file that is intended to be recorded to the tape. The decode mode takes captured raw "audio" data and extracts data from the RFC-1662 frames. The tool can be configured to read/write from files or stdin/stdout. This makes it convenient for setting up a pipeline to read/write the tapes with. Here is the help output with a description of all command line flags that can be passed to the tool. (OR required)  Put the tool in encode mode. (OR required)  Put the tool in decode mode. available to read for the client without blocking. A tool for storing binary data on DAT tapes. The following commands generate a tape image and decode a captured tape image, respectively. This encodes a photo from a local car meet that I atteded recently. These commands can be chained together with aplay and arecord. More details on that next. Linux comes with a rich set of tools for working with audio. 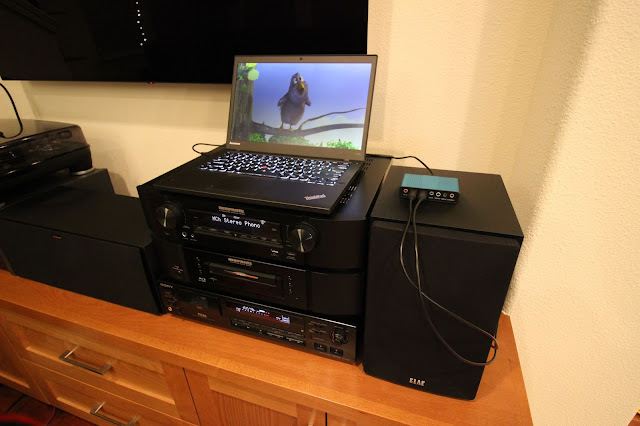 This demo requires the lowest level of access to the hardware, playing back and recording raw files. The aplay and arecord commands from the ALSA project allow exactly this. First, I will list out the sinks and sources. This can be done for both aplay and arecord. This allows me to determine that the hardware address of my USB sound card is "hw:2,0". It is also worth noting that I changed the default input and outputs in the pavucontrol app to S/PDIF in and out. With all of this knowledge in hand, let's chain it together to allow video streaming from the tape deck and USB sound card. 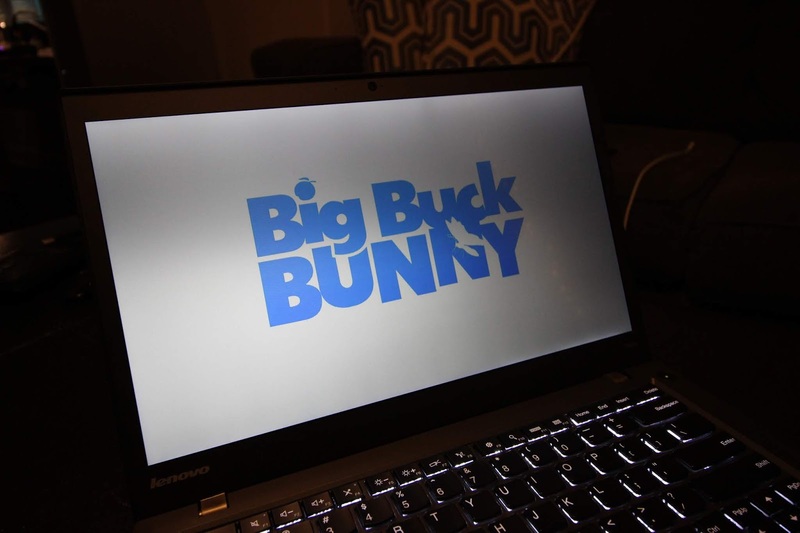 I decided to use Big Buck Bunny as a test, which is common when dealing with media and decoders/encoders. So first, let's grab Big Buck Bunny from Renderfarming. I like the1080p, 60fps version for the buttery smooth visuals :]. The video is roughly 10 minutes long which means the file needs to be around 110MB to achieve real-time playback from the tape. The file is overweight at 356MB which means that some transcoding is needed to trim it down. I noticed that there is an extra audio track. That can be stripped out too. # Strip the AC3 audio track. MP3 is smaller. # Transcode to h265 with CRF 30. This yeilds a ~100MB file. 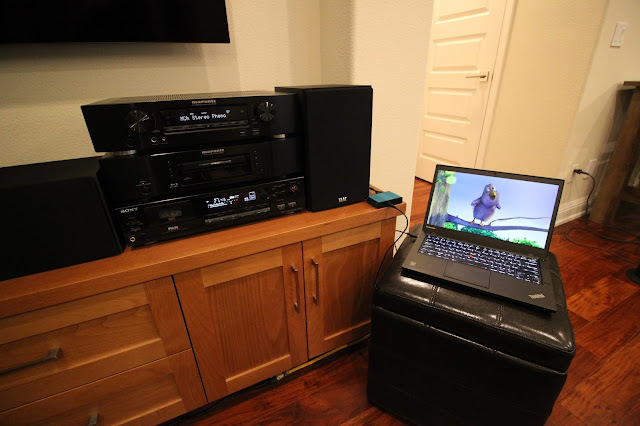 I used my Mac Pro for the heavy h265 transcoding so that my tiny ThinkPad T440s didn't have to work too hard and to speed up the operation. Once the file was transcoded into a file of suitable size, it was placed into MPEG-TS frames. MPEG-TS is typically used for DVB systems where interruptions in the stream may happen due to interference. Once the MPEG-TS stream was ready, the file was encoded with datvideo. Now that the image is ready, it is time to burn it to tape. First, the DAT deck is put into record mode. The DAT deck can be recording before starting to burn the image thanks to the RFC-1662 framing that allows detecting the start of binary data anywhere on the tape. The following aplay command is used to play the raw file to tape without modification. Now that the MPEG transport stream has been recorded to tape, it can be played back, decoded with datvideo and played back with VLC. Let the file bbb.ts buffer for a few seconds and then it can be opened with VLC for playback. It is a pretty crude setup, but it works surprisingly well. This was fun. I like doing quirky things with technology. I learned a few new things that I can probably use in my day-to-day work which is always nice. I probably won't go out and convert all of my favorite movies to DAT format, but this was certainly a nice way to spend a rainy weekend. I hope you enjoyed my zany use of technology and perhaps are inspired to do something yourself. I know one idea that comes to mind is TCP/IP over TOSLINK optical audio cables via the datvideo tool shown above. It should work rather well. Comments always welcome. Thanks for reading! A really cool project! Since you're using MPEG-2 TS as a container format anyway, I wonder why you're doing the extra RFC-1662 encapsulation step? Transport Streams are self-synchronizing too, so aplay bbb.ts -> arecord bbb.ts should work fine. Sure, players may have trouble identifying the resulting stream properly if it starts with non-video data, but forcing the file type via something like "mpv --demuxer=lavf --demuxer-lavf-format=mpegts" or "vlc --demux=ts" should work around that. If you manage to create a proper fixed-rate TS stream somehow (spoiler: FFmpeg and derived tools are of no help at that, sadly), it should even support proper live playback, i.e. "arecord | mpv -". Thanks Martin! I agree, MPEG-TS would likely work without the framing. I was able to store other data on the tape that does not have built-in support for this though, like JPEG, for example. A tar file is also an interesting idea. I also found that some players didn't like receiving audio data input. Forcing the file type is a good idea. Saw this on another site. My DAT player is being repaired at the moment but I hope to have it back soon and have a go with this! One quick question. When playing back, does it create the whole file (bbb.ts in your example) on the computer or is it just a small buffered section? In this case, it does create the whole file, but I had originally intended to rig this up so that it would just use a pipe to stream the video directly into the player of choice (mplayer, vlc). I couldn't get VLC to behave correctly when reading from stdin and I had a working demo. I think it should be possible to make this work though. I wish I had the programming skill and Linux knowledge to make this something that could be streamed. It would be fun to have a Raspberry Pi like box that would take the data stream and pump out at HDMI signal. I say RPi like as I doubt the Pi could do h265! Actually could you use h264 instead?